How the Aries Vane Gears work. How Aries Vane Gears Work. When the yacht goes off course the plywood vane through its connecting linkage rotates the servo rudder dead ahead. The water flow forces the servo rudder to one side pulling ropes which apply corrective helm to the tiller or wheel. 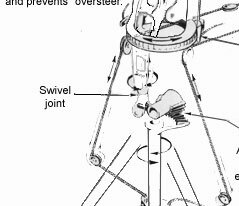 The servo rudder has only to pull the steering lines to steer. 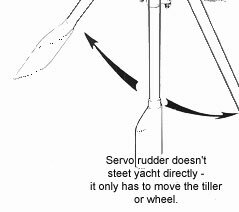 It does not steer the yacht directly (the servo rudder does in fact assist the main rudder in it's sideways thrust but only by a negligible amount). 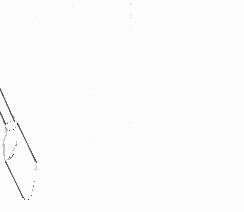 The plywood wind vane has to be feathered 'edge on' into the wind by pulling on the course adjusting lines (call them snaffle lines). When feathered correctly the vane is vertical or in line with the Gear. 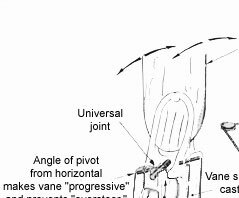 As the yacht goes off course the wind comes round on one side of the vane deflecting it from the vertical on its pivot shaft which in turn deflects the servo rudder from 'dead ahead' pulling the steering lines as previously mentioned. 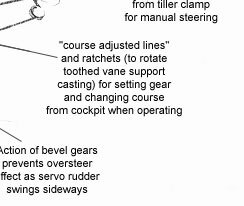 The two snaffle lines are used for feathering the vane ready for operation and for making all course adjustments when the Gear is working. 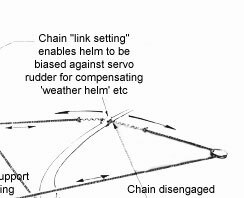 One pull changes course 6° but in practice you don't get this due to weather helm. Settings much smaller than 6° can be obtained by adjusting the tiller clamp and chain (or clutch in the wheel drum) but most owners don't bother doing this. The snaffles are especially useful at night as you can make any course adjustments by simply pulling once or twice etc, and have some idea of what you will get (unlike a wormwheel and endless cord). The snaffles can be lead into the cockpit or cabin and should be secured port and starboard so you know which one to pull. The ratchet arms are spring return and the snaffle lines can be left slack.